Dundalk racecourse is unique in that it combines a Horseracing course with a Greyhound track. It is also the only all weather racecourse in Ireland, and is 45 minutes from Dublin and an hour from Belfast. The horseracing generally takes place under floodlights. It is not a bad course, and is certainly worth a night out at, the standard of horseracing tends to be better than that at the English all weather racecourses. Dundalk is left handed oval of 10 furlongs with a chute start for the 5 furlong races. 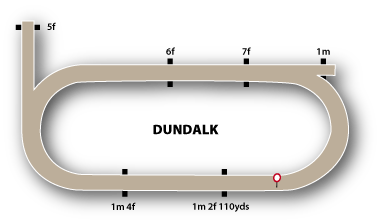 The racing surface is Polytrack, and being a bit longer than most of the other AW courses, also tends to be a bit fairer, the finishing straight is two and a half furlongs long. As a result there isn’t one particular type of running style which is suited by Dundalk. The configuration it most closely resembles is the Southwell AW course.